A new Fancy Pants game is coming soon! We just found out that Brad, the original Fancy Pants creator is gonna release a new Fancy Pants version with new levels, new enemies and much better graphics. Which is a great news since we finished the last game and thought this is the last one. So… no! A new game is progress and will be available in the next few months. Did you enjoy the Fancy Pants Adventure series? It is a brilliant arcade/platform flash game and it has won the hearts of gamers from all around the globe! However, so far we have only seen three installments in the series and we are currently awaiting Fancy Pants World 4 to come out! The latest installment in the series is bound to feature some drastic improvements and pleasantly surprise us, considering that all the previous games were major improvements compared to their previous title. However, the third game’s success will be rather difficult to beat and the game developer will probably have to gather a larger team this time in order to fit everything together the proper way. It is clear that this will not be the easiest task since the previous games already seemed rather perfect to be honest. So, the question remains – after the great success of Fancy Pants 3, what can we expect from the new Fancy Pants World 4? Now, a lot of people will ask if there is really anything that needs to be improved. After all, the music was great and fitted the theme of each game perfectly. So it’s better turn on the speakers, not like in Scary Maze Game where you just hear a stupid scream. In the third game every level had its own soundtrack and it perfectly complemented the graphical environment. Other than the fact that we will need new, fresh music in Fancy Pants World 4, there is really nothing that should be improved as far as this is concerned. And what should be done about the graphics and visual effects? We can say that the previous games were very satisfying as far as the visual effects and graphics are concerned but it would be good to see something new and fresh in this game. Some of the enemies haven’t been changed at all and some aspects could use better design or need to run more smoothly. The loading time was an issue on the previous game as well so this should also be something for the developer to think about. Fans have agreed on multiple polls and surveys that they do not wish for the game mechanism to change, unless of course the author thinks it is really necessary. With that in mind we can already assume that the next game will be an arcade platformer with some elements of action and RPG. We have already gotten used to the simple controls – the arrow keys and the S button and it is doubtful that there will be any changes as far as this is concerned. What we can expect though is some new, “fancy” features that we have not seen yet in the previous games. Remember how the developer surprised us with “Golfball” in the second game? It wasn’t anything that influenced the entire game, yet it was very fun and brought a new perspective into the whole series. This is why we can expect something new and exciting as well as humorous and entertaining to make the game more enjoyable. The previous game had a lot of humor and was really a pleasure to play to the very end and this is why humor should be an important part of the upcoming Fancy Pants World 4. So what can we expect from the new game? Well, obviously we can assume that it will fulfill all our expectations when it comes to the gameplay, graphics and brilliant soundtracks. The only things that we could really use are some new opponents, new levels and fancier customization options. I can guarantee that I will play Fancy Pants 4 as soon as it is released since all the games so far have been absolutely great! If you haven’t played all of the games in the series so far I recommend that you give them a shot as they promise several hours of quality entertainment and will make a nice, relaxed gaming session. You know what makes a good game? I will tell you: interesting graphics that don’t have to be strictly all textured or 3D, good storyline and funky music. Well, Brad Borne obviously took these factors to a whole new level when he made a game he called Fancy Pants World 1. This is a platform, adventure game that made me laugh (in a positive way!) as soon as I started playing it. No, even before I started the first level. Why? Well, give the main menu and the player controlled character a look once as soon as you start the game and you will see! You can play this game In this site. The main menu basically consist of doors – ‘those’ doors that can lead to other levels, dimensions etc. It is very easy to choose a level or start a new game if you haven’t played this game before from here. After you start the game, you immediately found yourself in the black and white world, fighting with all kinds of creatures ready to take your health away, collecting some kind of spiral coins and regaining health back and progressing through the level. I won’t talk too much about the enemies’ brains because it is standard for all platformers: spiders (the first enemies you will encounter) roll back and forth and your job is to have them taste your feet. Controlling your little stick man can be odd in the beginning, but you’ll get into it really fast. That is because the control pattern is really unusual: left, right arrows are for movements; S is for jumping, up arrow is for entering the doors and down arrow is for rolling. If I ever find Geier Arnold, I will definitely congratulate him and hire him to compose an entire CD, regardless of the money, because this guy is genius. He put “simple” to a whole another level with his music. I really felt it and fell in love with the soundtrack. It left me speechless and really goes great with the whole game concept. The whole environment is just great to watch and feel. Levels are designed so nicely that you have the feeling like nothing is missing; it seems just perfect – simple and without pap (thank God for that!). The graphics are amazing and, as I said in the beginning, the animations are really smooth and full. You get all kinds of impression from the characters, depending on the situation they are in. For example, you can roll while holding down arrow or the jumps, which are different if you jump forward or backward (character does the flip back; it looks as it sounds – cool), or when it falls from a distance – it makes adequate noise and seems like it hurt itself. Finally, I left the sweet stuff for the end. “Why is this game called ‘Fancy Pants World’”, you may ask. Well, that is because the main protagonist (in the form of a stick man) has, not only one of the best haircuts I have ever seen, but also color pants that shine so fancy. You can always change the color of it in the options menu; by default, the pants are yellow, but I prefer red, because it makes me feel fancier. Did you enjoy World 1 of the Fancy Pants Adventure game? certainly found it amusing and it was one of the better platform games made in Flash that I had seen. However, the following installment in the series called Fancy Pants World 2 was much more enjoyable to play and had a very high entertainment factor. Running around and jumping up high platforms takes a whole new level with this game as there are a lot of new moves that you can perform. The first world didn’t really have any story or background nor did it provide any sort of useful tutorial to get you started. While this doesn’t really matter much in a game such as this, the second game really tried to improve on that. Thus, your mission in Fancy Pants World 2 is official to find the angry bunny that stole your ice cream! It sounds very childish, but the humor throughout the game is very good and gives the game chilled-out groove. It isn’t really a game where you have to be very focused and stressed out as there is no reason for that. It is a rather easy game in fact although some parts will be quite difficult to master at first. The gameplay is, of course, very similar to the first game but it has evolved from the original and certainly has some new features. One of the more interesting new mechanics is that you can jump from wall to wall in a manner similar to what can be seen in all of the older Spiderman games. Along with this you can turn enemy snails into your own private football balls and use them to collect bonus points and coins for your character. The author has also included ladders and wines into the game which will make our little hero feel like Tarzan from time to time! The game developer has also decided to add signs along your journey which give valuable tips and information and provide you with a quick tutorial in the beginning of the game. Even though the tutorial side of things has not been very well planned, the game is very welcoming towards new players and there is plenty of time to learn how to play and enjoy Fancy Pants World 2! The game’s graphics have advanced a bit but have not changed their style. 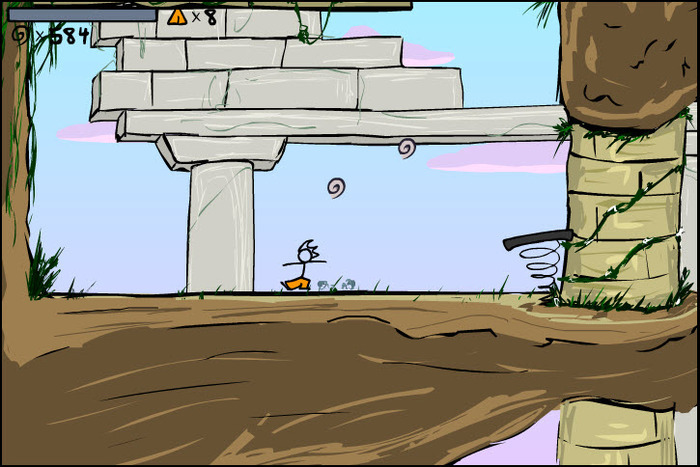 The game still features a humorous, cartoonish atmosphere with matching graphics. The audio effects blend well with the style as well and they complement the game well. The game reminds greatly of Super Mario, but I honestly enjoy it more than this classic platformer. The new Fancy Pants World 2 also brings in more bonus rooms and trophies into the game and is a much bigger challenge than the previous game. The game isn’t hard, it is just rather long to complete if you get lost start vising places where you have already been. Overall, Fancy Pants World 2 is certainly worth playing! In this site I will recommend the best free games available online. I will update this blog once a week so it’s better to keep this address somewhere and comeback later.